Heat oven to 325°F. Spray 4 (5 to 6-inch) shallow ramekins with Crisco® Original No-Stick Cooking Spray. In medium bowl, beat sweetened condensed milk, chocolate hazelnut spread, flour and egg with electric mixer on medium speed until well blended. Pour about 1/2 cup of the batter into each ramekin. Place ramekins on 15x10-inch pan with sides. Bake 30 to 35 minutes or until edges are set. Cool 10 minutes. In small microwavable bowl, microwave preserves on High 30 seconds or until heated. 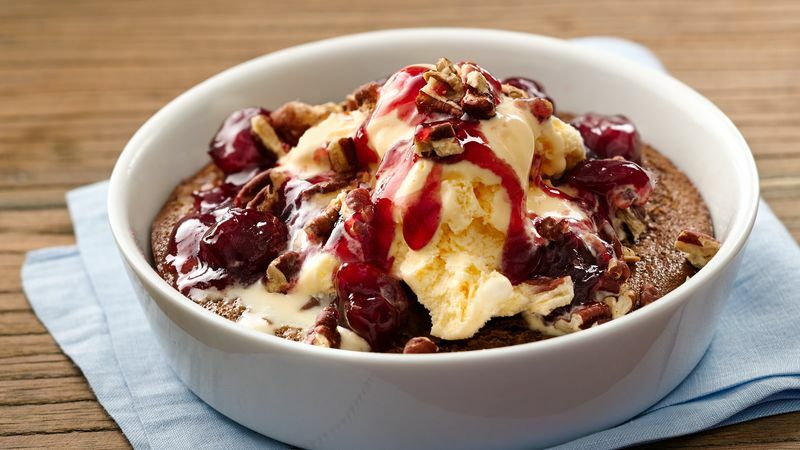 Top each warm brownie pudding with 1/2 cup ice cream, preserves and pecans. To toast pecans, spread in ungreased shallow pan. Bake at 350°F 6 to 10 minutes, stirring occasionally, until light brown. Brownie puddings can be baked in 4 (10 oz) ramekins or custard cups. Bake 35 to 40 minutes or until edges are set.